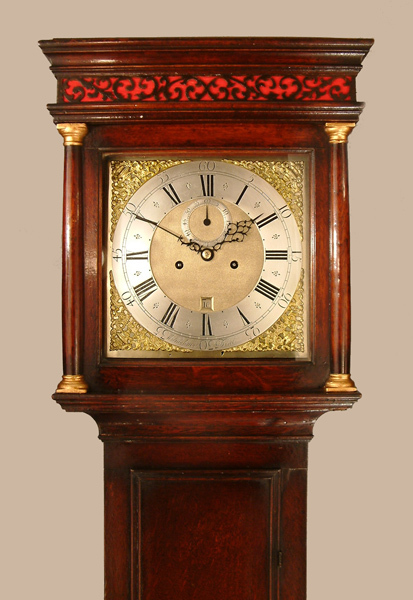 Thomas Wilmshurst London Longcase Oak Mid 18C - Height 80.3in. This Longcase Oak Archive's Maker - Thomas Wilmshurst is recorded "apprenticed in 1713 to the widow of John Finch who was Master of the Clockmakers Company ( London ) in 1707". A small, well proportioned, long door, plain oak case with flat top, "silk" backed fret, rear quarter columns and side windows to hood. The hood door with "columns attached." 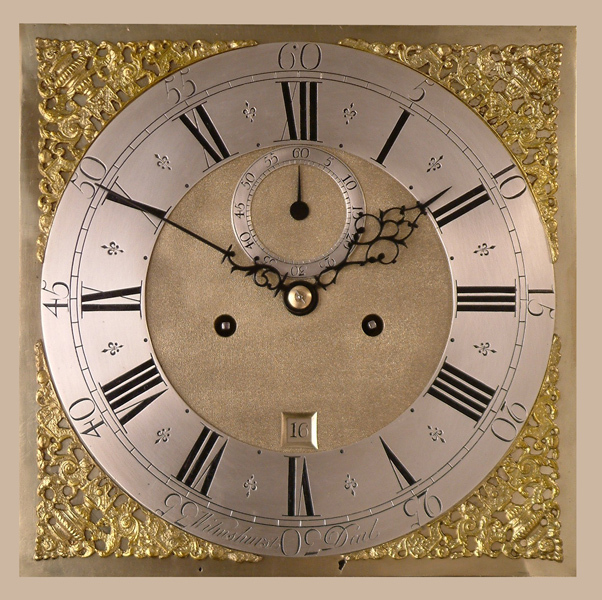 12" square brass dial with finely matted centre, urn spandrels, subsidiary seconds dial and square date box. The raised chapter ring having small "floating" half hour markers and signed along the lower edge "Wilmshurst Deal".Blued cut steel hands. High quality 5 pillar 8 day movement with hourly ( rack ) striking on a single bell. Thomas Wilmshurst is recorded "apprenticed in 1713 to the widow of John Finch who was Master of the Clockmakers Company ( London ) in 1707". 80.3" ( 204 cms. ).